Himalaya Friends Corner restaurant, in the old Mom’s Dumpling and Noodle location, sells dishes from across the Himalayan region with options from Tibet, India, Nepal and Bhutan. The primary owner was a Buddhist monk in Tibet before immigrating and opening his first restaurant in Virginia. He and his two partners did all of the remodeling of the restaurant space themselves, including hand building the wooden chairs and tables. They have a range of dishes built around Yak meat, which they describe on the menu as being a particularly healthy meat. The day I was there the kitchen was pretty slow getting our orders out, but the main dishes we had, the Mixed Veg Pakora and Nepali Thali, were really good. 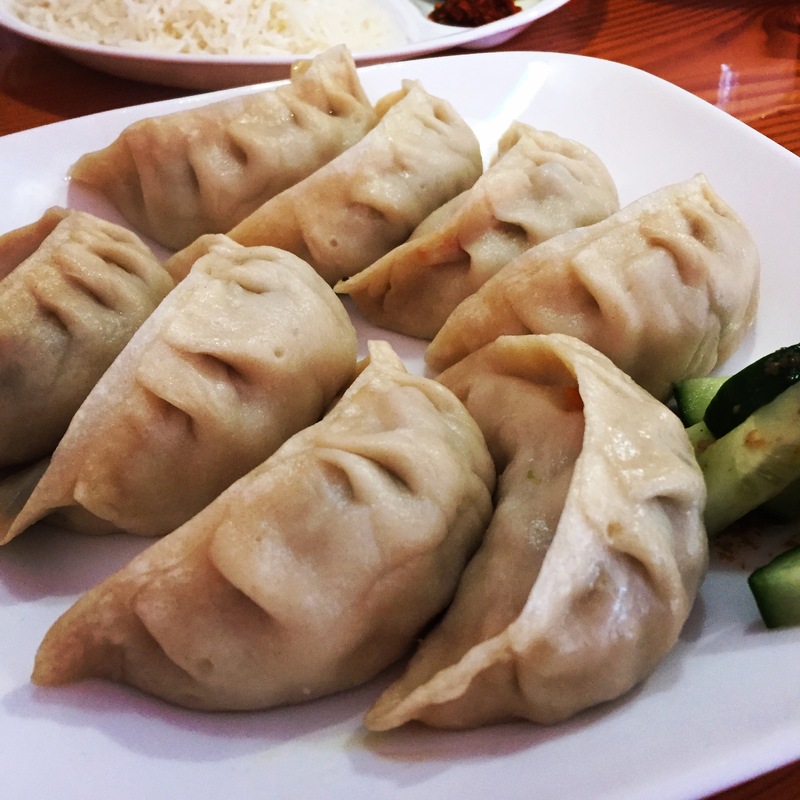 The Dumplings: Himalaya Friends Corner sells six types of handmade Momo: Yak, Lamb, Beef, Chicken, Pork and Vegetables. I was planning to try the Yak dumplings but they are $22 a plate, so I tried the vegetable and the lamb Momo. The Momo are served with a side of seasoned cucumbers pieces. 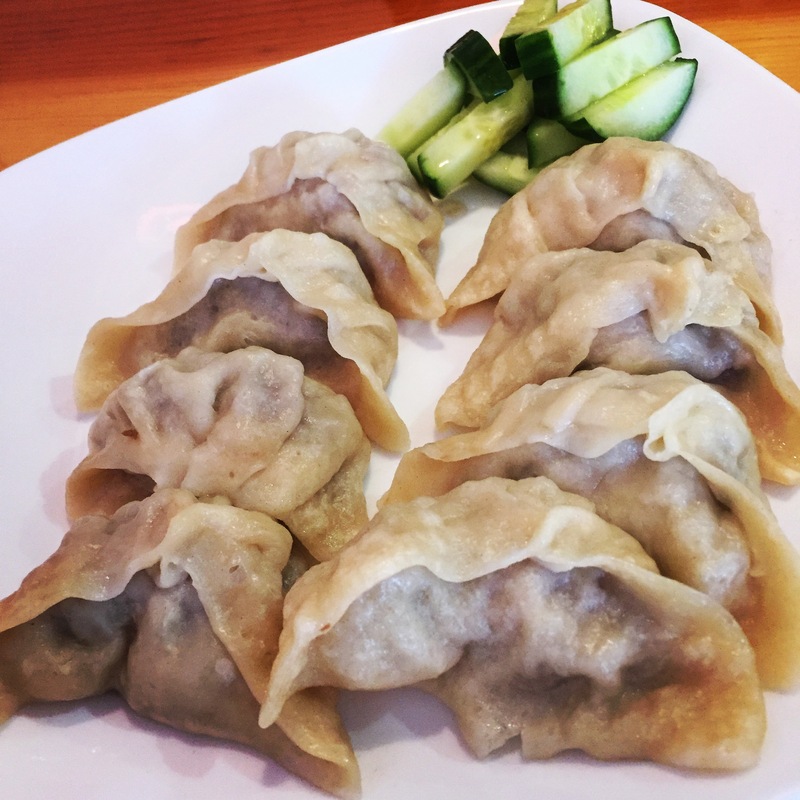 The vegetable Momo are vegan and stuffed with cabbage, carrots, green peas and spinach. These Momo are large and packed with finely chopped filling, each piece was probably equivalent to a daily serving of veggies. The hand rolled wrappers were a good thickness, somewhere between a Chinese dumpling and a Gyoza wrapper. The filling had a clean, fresh taste of steamed veggies, which I thought was under-seasoned, but my lunch companion rated them as the best dumplings she has had in a long time. While I thought the vegetable momo were meh, the lamb momo were fantastic. They were filled with seriously flavorful lamb, which was savory with a complex, slightly wild game flavor. The steam cooking left the momo really juicy, they were almost like soup dumplings. I will be heading back to Himalayan Friends Corner to get another order of these momo. The Dipping Sauce: Himalayan Friends Corner provides four squeeze bottles of sauce – a really spicy red sauce, a sweet and spicy sauce, a sweetened thick soy sauce made with Chinese mushrooms, and a tangy, blue cheese-esque tasting, cheese sauce. Each of these sauces is really good, and this palette of options really elevates the restaurant. The Location: the restaurant is just off the corner of the Amherst common at 61 Main Street. Over the past 10 years, this spot has housed Fresh Side, Mango Mango and Mom’s Dumplings and Noodles. This entry was posted in Amherst, Lamb, Momo, Vegan, Vegetarian. Bookmark the permalink.